The focus, naturally, is on a moment of controversy in the Scottish Cup semi-final meeting between Celtic and Inverness Caledonian Thistle. One incident has generated a slew of comment and frustration, not least because it was a clear turning point in the game itself. Celtic would have moved 2-0 in front had Leigh Griffiths' header not been stopped on its path towards the goal by Josh Meekings' hand. 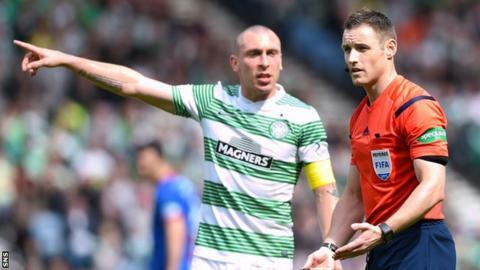 Three officials were nearby and, according to the Scottish Football Association chief executive Stewart Regan on Twitter, the contact was "missed" by the additional assistant referee Alan Muir, who was the closest. We have to presume that the referee, Steven McLean, and his assistant, Frank Connor, also did not see the ball strike the Inverness defender's hand, since the clear, unambiguous consequence was to award a penalty kick. Celtic fans are infuriated, since they will consider the incident as the sole reason the team did not complete a treble this season. They are right to be irked, since it is reasonable to expect at least one of three officials to be well-positioned enough to spot a clear handball inside the penalty area, but neither a game nor a season can be reduced to a single moment. Celtic were at a disadvantage once they were reduced to 10 men in the second half - after Craig Gordon was rightly sent-off for fouling Marley Watkins inside the area - yet they might have been facing 10 men while holding a 2-0 lead if the handball had been seen. Even so, mistakes happen, and they contribute to the unpredictability of the game. Fans are inevitably riled when decisions go against their team. Players and managers can be, too, but they are factors in a game that need to be managed like any other, such as opponents scoring, or a key player being injured. So should they be eradicated? Do the events of Sunday add further weight to the argument for video evidence being used in games? In one sense, they do. It was a pivotal moment and clearly evident on television pictures. If McLean did not see it, and a video referee was able to immediately ask him if he had, then a penalty could then have been awarded. It seems simple enough, but issues remain. What if there isn't a stoppage in play, is the referee having a conversation and making a decision based on a review while the game is ongoing? What is the psychological impact of being asked if he has seen something that he has not, since other decisions later in the game have to be made on their merit. The system works in rugby union because there are plenty of stoppages of play and the big screens at games allow supporters to review the footage - adding an element of drama. It would also be easier and cheaper to implement than goal-line technology, since most top-flight and all major matches are covered by broadcasters, who could make a television feed available. Yet there has been little willingness amongst the game's governing bodies to move the use of technology beyond the goal-line systems that are now in use in some of the major leagues, including England. There is also a case to be made for limiting further expansion. Mistakes, misjudgements, poor form are all ultimately part of the game's appeal, because they influence matches, just like a moment of skill or awareness, or tactical and selection decisions made by managers. Infallibility would rob the game of some of its uncertainty. A match ebbs and flows, it takes on a form of its own depending on the incidents that unfold. More stoppages, however brief, will interrupt that. A balance needs to be struck, and reviewing a handball like the one seen in Sunday's game at Hampden is probably right on the cusp of that balance. There is nothing subjective about whether or not the ball has crossed the line, which is why goal-line technology was eventually implemented. Other decisions are often less clear cut and rely on an official's subjective view, so who is making them? The ultimate authority has to be the referee's, although leeway has to be made to assist them as much as possible. A video referee might be considered a better use of an extra official than the Additional Assistant Referee - although Alan Muir correctly spotted a handball on the goal-line during last season's Scottish Cup final between St Johnstone and Dundee United. The flow of a game can seem anarchic at times, despite all the pre-match planning of managers and coaches. Match officials, too, prepare professionally and endeavour to apply the rules and their judgement as evenly and accurately as they can. Errors are inevitable, yet a blame culture has grown. Ultimately, are McLean and his team of officials more responsible for the outcome than the 22 players on the pitch? That question is as justified as considering technological advances.